Transform your ordinary living room into an elegant and regal place to relax alone or entertain guests. By adding sheer silhouette window shades, luxurious throw pillows, and a cozy blanket, you create an inviting and welcoming ambiance. 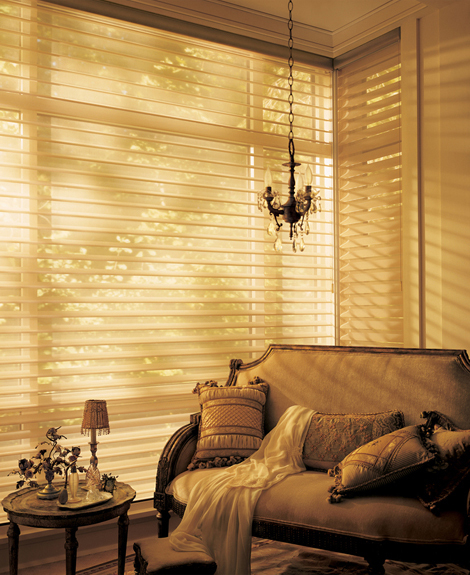 Custom silhouette shades filter the harsh natural light and transform it into a warm glow. With arched moulding, custom silhouette window shades, and luxurious drapery panels gracefully pooling on the floor, these windows certainly make a dramatic statement. Add braided and tassled tie backs to hold the side panels in place for the finishing touch. The soft beige tone of the shades allows them to blend into the room. 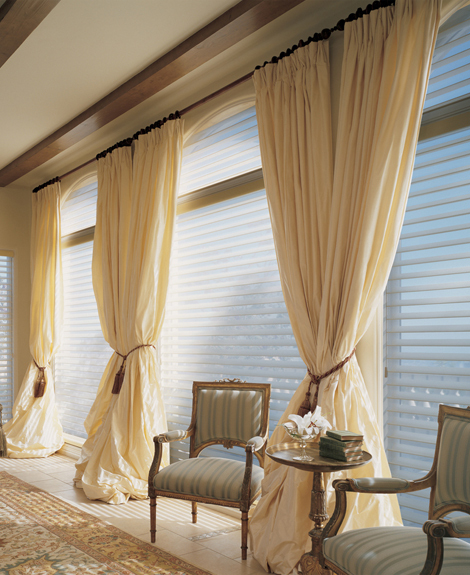 These neutral colored silhouette window shades used as both top and bottom window treatments are the perfect fit for these massive picture windows and go beautifully with the room’s area rug. So divine are these windows that it would be a shame to hide them with draperies and valances, which is why the simplicity of this particular shade works so well. 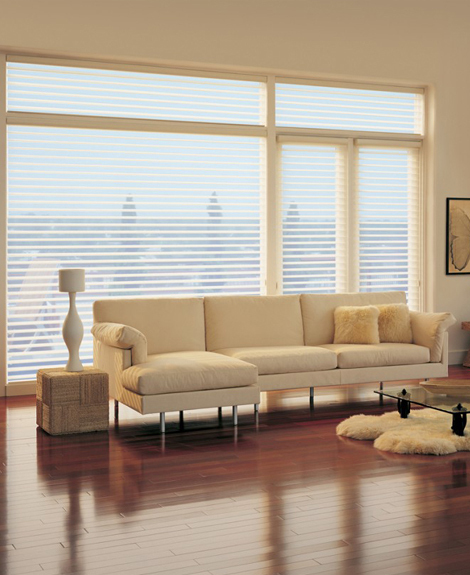 It is surprising that this combination of horizontal silhouette shades and vertical blinds is seldom seen because, as the picture clearly shows, it works very well – particularly with the area rug and upholstered chair with throw pillow. No need for fancy valances or cornices. As proven by this easy on the eyes setting, sometimes simpler is better. 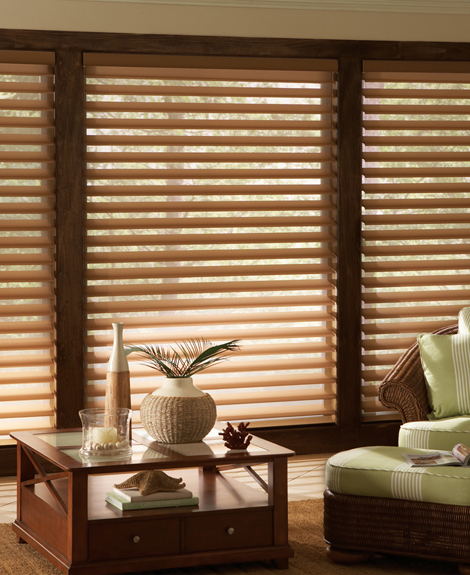 It isn’t always necessary to contrast blinds, window frames, and wall colorings. These beautiful yet practical silhouette shades blend in perfectly with the framing and wall coloring to create a smooth, uniform look that is pleasing to the eye. The mild contrast of the tones in the floor carries over to the table continuing the theme. 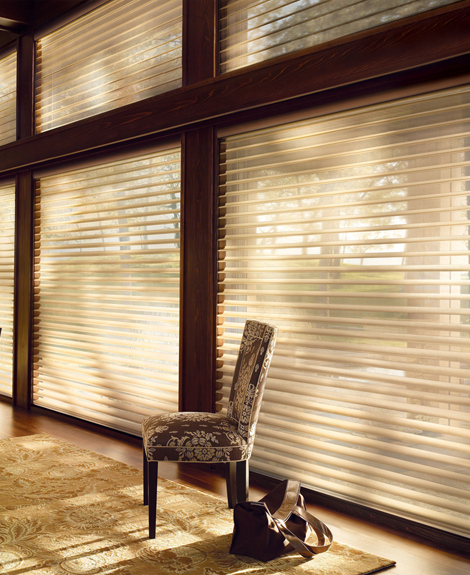 With silhouette blinds in both the top and full-length bottom windows, it will be possible to create virtually endless lighting effects in this room. 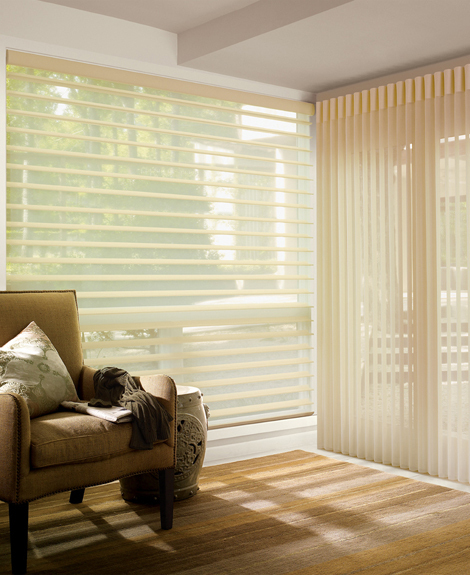 Appreciate the view outside or close the blinds entirely for more privacy. 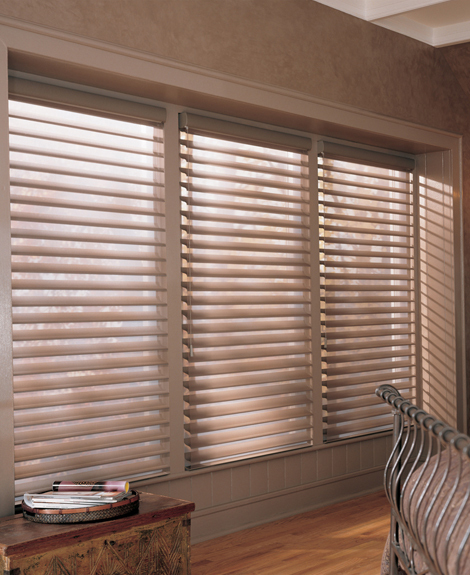 Close the bottom blinds and open the top vanes wide for both privacy and warm, natural light. Once again, non-contrasting blinds blend perfectly with the grand window frames, wall, crown molding, and even the ceiling color. This contrasts mildly but nicely with both the wood tones in the floor and pattern of the throw rug. 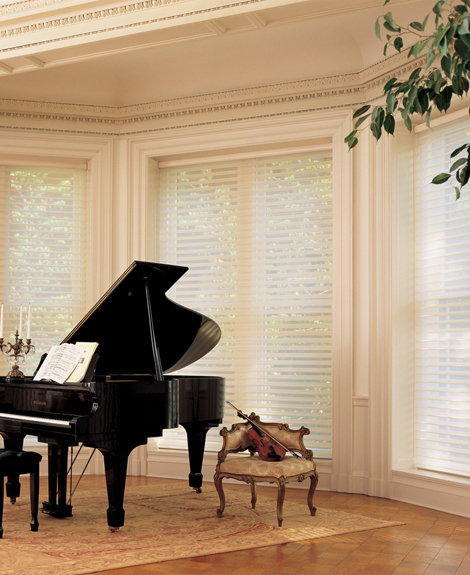 With so few distractions, it will be easy to focus on the melodious beauty created within this music room. There is a layered contrasting effect presented here by the throw rug, flooring, window frames, silhouetted shades, and wall colorings. Combine that with the wood tones of furniture and the accents created through the upholstery and throw pillows and it all comes together for the ideal place to read or relax. Open the vanes for a stunning view. With a cityscape like the one that makes up the view from this combination of windows and double doors, it would be a shame to have the blinds closed. 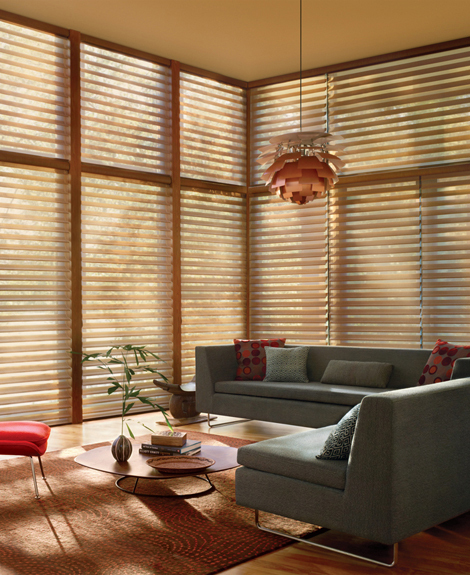 However, for privacy and light control the vanes of these silhouette shades can be completely shut. The subtlest accents are provided by the throw pillows and end table.